Triad Magnetics strives to deliver magnetics technology solutions that innovate, push boundaries, and set new performance standards. The drive to innovate is built into our company DNA — we have been innovators since we were founded more than 60 years ago. Triad Magnetics was the first to design and manufacture a 100W audio transformer, revolutionizing the world of concert audio. We also custom designed and manufactured the magnetics that were built into the first microwaves in the 1970s. Our magnetic components have even been to the moon. Our desire to constantly create new magnetics that perform better than those that have come before has continued to strengthen over time since our inception as a company. We apply that passion to every component we make, including the inductors and toroidal power supply transformers we manufacture for the power conversion and measurement industry. The power conversion and measurement industry is growing at a rapid speed. It’s not just energy-related industries that are spurring this growth — virtually every industry has power conversion and measurement requirements. In order to maintain this growth, advancements in the magnetics components must keep pace. As technology advances, power management systems increase in size, speed, and intelligence. At every stage of the power distribution system — from the source, power plants and renewable energy farms, to the end user, and everywhere in between — higher volumes of power are being moved. Triad Magnetics designs and manufactures sophisticated magnetic components that can keep up with the high frequency, high density, and high power demands of the power conversion and measurement industry. We manufacture a number of innovative magnetic components used by the power measurement and conversion industry. Our offerings include a variety of power converter transformers, power measurement transformers, voltage converter transformers, and protective and measurement transformers. One type of power converter transformer we manufacture is a high-power switch-mode boost inductor. Capable of converting high voltage DC current, these inductors are commonly used in the energy field, particularly in the renewable energy power generation industry. Also notable are our precision toroidal power supply transformers. Commonly used in complex electronics, medical equipment, and other sensitive applications, our precision toroidal transformers provide excellent conversion rates with guaranteed low leakage current and low stray field values. The power conversion and measurement field is advancing quickly. The magnetic components that Triad Magnetics develop and manufacture for the field are advancing at the same pace. Our engineering team has ISO certified research and development, manufacturing, and testing facilities at their disposal — all to make sure that our products match the speed of innovation in the industry. 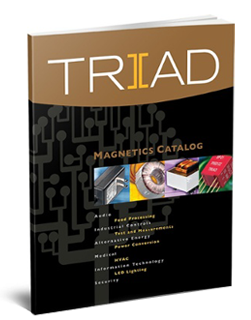 To learn more about Triad Magnetics’ standard and custom magnetic components, contact us today.